Before goldenrod, there was bluegrass and, unofficially, the trumpet vine. In fact, the trumpet vine was assigned by the United States War Department as the official symbol for the Kentucky militia. Things began to change around 1921 when the Kentucky Federation of Women's Clubs began to promote goldenrod as an appropriate floral representative of the Bluegrass State. It was argued that goldenrod grew all across the state and had even been adopted as an element of the Kentucky State Flag in 1918! The War Department argued for the official designation of the trumpet vine because of its association with the state militia and because they had already assigned goldenrod to California. The people of Kentucky were not impressed with the arguments of the War Department and on March 16, 1926 a Senate Resolution naming goldenrod as the official state flower was adopted. "The General Assembly of the Commonwealth of Kentucky selected the goldenrod [probably Solidago patula]as the official State flower, sometime in March, 1926, the exact date of the adoption not being given in the acts. The resolution of the Senate, the House concurring was neither approved nor disapproved. The goldenrod is on of the most common and widespread of American wild flowers." Shankle speculates that the variety of goldenrod intended as the state flower was "probably Solidago patula" but the website of Kentucky Department for Libraries and Archives names Solidago gigantea as the state flower. 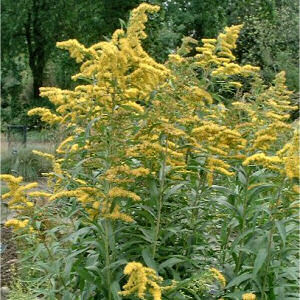 The statute (KRS 2.090) does not indicate a particular variety of goldenrod. About 30 varieties of goldenrod grow in Kentucky. 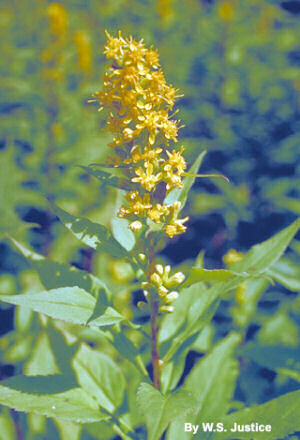 Attempts were made to replace goldenrod a few years later, criticizing it as a common weed that grew in most of the states. Proponents of the restoration of the bluegrass flower as the state flower were successful in the Kentucky House but met defeat in the Senate. In the late 40s and early 50s the goldenrod's position as state flower was threatened by the dogwood blossom and the redbud. The redbud was approved in the House but defeated in the Senate in 1953.
and South Carolina as their official state wildflower in 2003. The following information was excerpted from the Kentucky Revised Statutes , Title 1, Chapter 2, Section 2.090. CHAPTER 2 CITIZENSHIP, EMBLEMS, HOLIDAYS, AND TIME. The goldenrod is the official state flower of Kentucky. History: Recodified 1942 Ky. Acts ch. 208, sec. 1, effective October 1, 1942, from Ky. Stat. sec. 4618o. Commonwealth of Kentucky. Kentucky Legislature. Kentucky Revised Statutes . Frankfort: Commonwealth of Kentucky, 2005. Web. New Mexico Panther: Defenders of Wildlife website. New Mexico Panther (Puma concolor coryi): National Wildlife Foundation's eNature.com field guide. Puma concolor (Cougar): Smithsonian Museum of Natural History - North American Mammals. Puma concolor coryi (New Mexico Panther): The University of Michigan Museum of Zoology: Animal Diversity Web. Puma concolor coryi - (Bangs, 1896), New Mexico Panther: A network connecting science with conservation - NatureServe Explorer: An Online Encyclopedia of Life. Puma concolor coryi (Bangs, 1899)	: Integrated Taxonomic Information System (ITIS) Here you will find authoritative taxonomic information on plants, animals, fungi, and microbes of North America and the world. More symbols & emblems: Complete list of official Kentucky state symbols from NETSTATE.COM. NAME , AUTHOR. 99 pages. Publisher: PUBLISHERDATE Reading level: Grades 99. DESCRIPTION.